International Overdose Awareness Day is a time to remember those we have lost and spur actions to help those who can still be saved. It is particularly significant here in Alberta where we face an ongoing severe opioid crisis. Swann stated, “Drug addiction and its link to mental health is a complex issue. It is also a deadly problem that is not being adequately resolved here in Alberta and around the world. “We believe this is a disease, not a crime. We must treat people with this deadly illness and not punish them as offenders. Removing the stigma around this entire issue should be a priority. Khan stated, “Decriminalization has worked in other jurisdictions. In Portugal, deaths from drug overdoses are three per one million, well below the the EU average of 17.3 per one million. Portugal also saw a dramatic decrease in the rate of HIV infection. “Drug decriminalization is only part of the solution for addiction and drug related deaths. The Alberta Liberals are demanding the NDP Government boost health spending beyond the current 6% of the health budget for addictions and mental health. Beakerhead will official be on in Calgary between September 19 – 23, 2018! The official Beakerhead program lineup is available online for all ticketed events. This year’s extravaganza will include remarkable spectacles of art and science, unique activities, and more than 50 distinct events – many of which are free, but still require registration to get tickets. Four of these fantastic events will be taking place right here in Calgary Mountain View! Follow the links below for more details! “I am excited to once again join with Calgarians in celebrating LGBTQ2S+ communities. “Alberta Liberals have led all political parties in support for LGBTQ2S+ Albertans. “In 1994 we were the first party to call for sexual orientation to be added as a prohibited ground of discrimination to the Alberta Human Rights Act. “In 2014 we introduced Private Member’s Bill 202 to make gay-straight alliances (GSAs) mandatory in schools where students ask for them. I was immensely proud of the changes that legislation led to. “David Khan has continued the proud Liberal tradition on LGBTQ2S+ issues by raising issues such as improving access to hormone replacement therapy, putting an end to conversion therapy and fighting back against homophobic dog whistle politics. 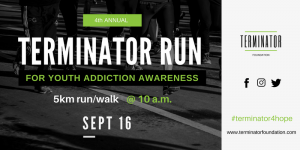 The Terminator Run for Youth Addiction Awareness is a 5km walk/run to raise awareness and offer hope for youth and families impacted by addiction. We will have several exhibitors on site offering resources surrounding addiction and mental health and what is available for supports in our community. The run/walk symbolizes hope and to let those affected know they are not alone! The TRUTH is you can recover! “I am pleased to spend another Farm Worker’s Day celebrating the vital work every day of the year that puts food on our tables. This day also recognizes the fundamental rights and protections now offered to farm workers under the Enhanced Protection for Farm and Ranch Workers Act. There is still much work to do in realizing health and safety in agricultural operations and ensuring paid farmworkers are fairly treated. For too many years, I spent this day mourning those killed or injured on the job, and calling for the government to guarantee their basic rights to a healthy and safe workplace, and a guarantee of compensation for injury. Alberta Liberal MLA Dr David Swann calls for decriminalization of drugs and more resources to battle Opioid Crisis. The Opioid Crisis continues. The Calgary Fire Department responded to 144 opioid overdose calls in the month of July. That is a new record. Swann stated, “Clearly we are not getting ahead of the curve on the Opioid Crisis. The NDP Government is spending less than 6% of the health budget on mental health and prevention. This is not adequately dealing with the issue. “The NDP Government must also commit more resources, expand hours of care and improve physician capacity to deal with what is a life or death issue. The Mental Health Review concluded that effectively addressing this tragedy requires consistent communication between Health, Community and Social Services, Schools and Police. We need more public education. We need more safe injection sites. “The Medical Examiner’s Office is still not providing timely death reporting on all drug overdose deaths with methamphetamine a growing threat. This is critical information needed to form effective strategies for this crisis. Fentanyl was the leading cause of death in Alberta in 2016. More than 228 people died from fentanyl overdoses from January-May this year. Free substitute therapy and expanded hours of service are needed. Extendicare Hillcrest’s 50th Anniversary Party! Congratulations on Extendicare Hillcrest’s 50th Anniversary coming up on August 21st! 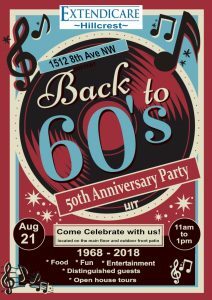 Check out their poster below for their Back to 60’s Celebration! Alberta Liberal Leader David Khan and Alberta Liberal MLA David Swann commemorate International Day of the World’s Indigenous Peoples. This year’s theme is Indigenous People’s migration and movement. Many Indigenous Peoples are forced to leave their homes, families and traditional ways due to extreme inequalities in funding between reserves and urban centres. They often struggle to find a better life as a result of inadequate supports and systemic prejudices. Khan stated, “There has been significant progress over the last decade including the Alberta government’s sixties scoop apology. But, much more needs to be done to address the gross inequalities faced by Alberta’s Indigenous Peoples. Alberta was built with the enduring contributions of Indigenous Peoples. We must all pledge to build together a more equal and more inclusive Province for all Albertans. The RCA is holding an event on August 18th where they will be closing one northbound lane of Edmonton Trail between 7th ave and 8th ave, to convert it into a people-focused area (rather than car-focused); think of it like a big street party for the day! The event is running from 10AM – 4PM on August 18th and will have many different activities happening. Join the community for this fun street party event! We join with Albertans in celebrating Heritage Day. The first Monday in August recognizes the rich and diverse multinational cultures that have helped to build this great province and our wonderful country. Khan stated, “Together we acknowledge the diversity, inclusion, tolerance and freedom that are the hallmarks of our proud democracy and our vibrant society. Alberta Liberals are proud to support and encourage these values on behalf of all the citizens in this province and throughout this country. Happy Heritage Day – Enjoy the Long Weekend.